Special tanks for extraction of hops into cold beer. 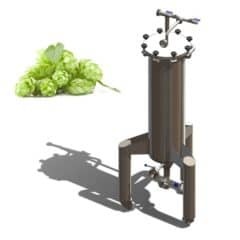 “HOP EXTRACTOR” – Dry hopping tank – is an equipment for extraction of aromatic active substances from hops into cold beer (dry hopping) – an infusion of hop extracts to finalized cold beer after finalizing the beer fermentation process. This equipment is used in the production of strongly bitter beer types, such as IPA (India Pale Ale). The capacity of the hop tank is 25 liters. A cylindrical vessel on three legs with wheels. It is used to dissolve granulated hops in finished beer. It does not increase the bitterness of beer and it supports the special aroma of hops. Effective extraction of hops, a united and definable beer aroma, reduces the consumption of hops. This equipment is simply used and It can be easily integrated into the existing fermentation and filling. 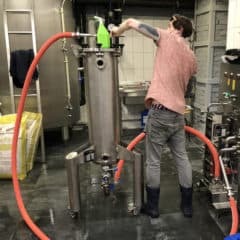 “HOP EXTRACTOR” – Dry hopping tank – is an equipment for extraction of aromatic active substances from hops into cold beer (dry hopping) – an infusion of hop extracts to finalized cold beer after finalizing the beer fermentation process. This equipment is used in the production of strongly bitter beer types, such as IPA (India Pale Ale). The capacity of the hop tank is 60 liters. “HOP EXTRACTOR” – Dry hopping tank – is an equipment for extraction of aromatic active substances from hops into cold beer (dry hopping) – an infusion of hop extracts to finalized cold beer after finalizing the beer fermentation process. This equipment is used in the production of strongly bitter beer types, such as IPA (India Pale Ale). The capacity of the hop tank is 120 liters. 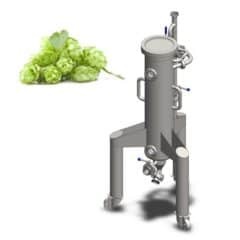 “HOP EXTRACTOR” – Dry hopping tank – is an equipment for extraction of aromatic active substances from hops into cold beer (dry hopping) – an infusion of hop extracts to finalized cold beer after finalizing the beer fermentation process. This equipment is used in the production of strongly bitter beer types, such as IPA (India Pale Ale). The capacity of the hop tank is 200 liters.